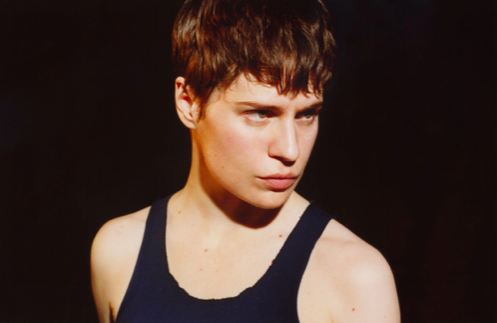 Chances are you discovered Christine and the Queens through Tilted, a Top 20 UK hit single that, thanks to Glastonbury and notable TV performances, seemed to be everywhere in Summer 2016. A subsequent album, Chaleur Humaine, proved this was no flash in the pan with its blend of seductive and intriguing electro pop giving sonic weight to the visuals. More than two years later and here she is touring follow up album Chris which is more retro funk in style. Tonight she describes the albums as “countries” on her journey with Chris being a “musclier and sweatier” version of the melancholic debut. This new confidence is immediate with the show opening like a stage musical. There’s a brief dialogue with the six backing dancers before Hėloȉse Letissier (aka Christine) enters to the opening bars of Comme Ci. It’s beautifully polished and crisp, high on energy and has the audience on their feet immediately, the whoops of delight carrying over into next song, Girlfriend. It isn’t all upbeat though and the contrasts in songs made for a captivating experience: the cartwheel-led euphoria of 5 Dollars; the slow motion exploits in The Stranger; the spotlit brooding, pulsing bass of What’s-Her-Face all provided thrills for different reasons. Tilted gets one of the biggest cheers of course, leading to compulsory audience involvement with everybody doing their face with magic markers. The diverse, almost rag tag ensemble of dancers complement rather than overcrowd the performance. There’s a lot going on with each dancer having their own path and narrative with Letissier often joining them for the chorus. She is still the focus and the four backing musicians are almost greyscale compared to the colour in front of them. Despite the vibrancy there is still a feel of minimalism and simplicity in the set. There are no costume changes and very few special effects (save for the picturesque snowstorm before Goya Soda). It is all about tight music and sharp dancing. The musician platforms separate throughout to create more space for dancing or to provide more intimacy when Letissier is alone in the slower numbers. While the show is a spectacle to be watched and enjoyed, Letissier is keen for the audience to be involved. Inviting us to accompany Night 52 with only claps as backing provides a welcome connection before she playfully segues into Michael Jackson’s Man in the Mirror. She gets even more up close and personal by appearing in the Circle for the encore (Saint Claude), before ending the show with Intranquillité, walking through the stalls to finally appear back on stage. Her songs and stories of identity and fitting in resonate with a diverse audience of all ages, yet this is a show that is perfect for anyone who likes both electronic pop and musical theatre. There aren’t many individuals still around in the pop world and it was a pleasure to spend the evening with one. “Don’t underestimate the power of a French song,” she told us. On this occasion, nobody could.